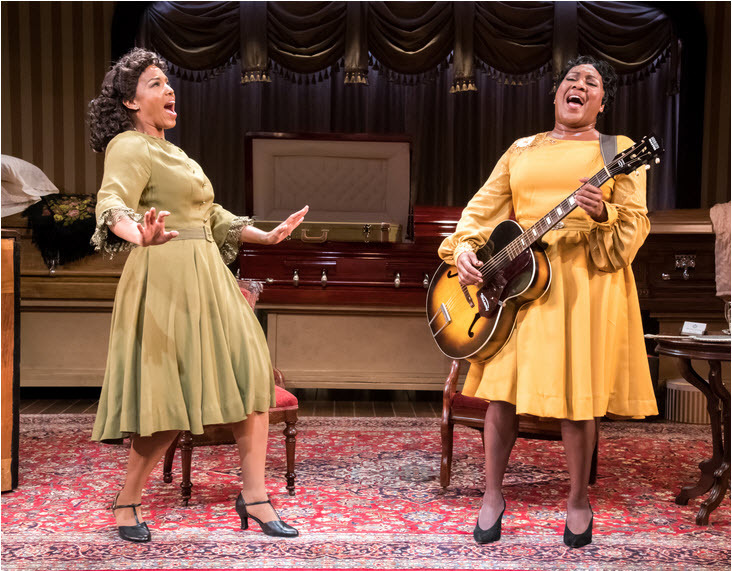 Celebrating the start of their fourth season under the artistic direction of Ari Roth, Mosaic Theatre gifts us with a standout DC premiere of Marie and Rosetta, the story of a unique collaboration between Sister Rosetta Tharpe and her younger protégée, Marie Knight. The drama and hilarity focus on a period when Rosetta’s meteoric Gospel career had gone off track. After years of pioneering a Gospel sound with a strong back beat, she fell from the church’s good graces, and that of her fans, for straying outside the strict lines of Black Gospel music. Her hope is that Marie, a younger, prettier singer, can revive her earlier successes and challenge her rival, Mahalia Jackson, another Gospel singer of enormous fame. Director Sandra L. Holloway brings out the extraordinary relationship between the two women which later developed into an abiding love. 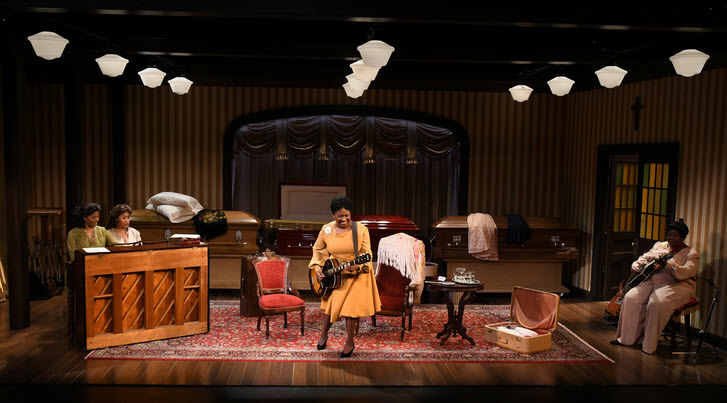 And Set Designer, Andrew R. Cohen places the scene in Mississippi amidst satin-lined coffins in the reception area of a funeral home – an incongruous place where many African Americans were forced to sleep and eat in the racially-divided Jim Crow South where Rosetta was often compelled to perform in front of a plantation backdrop in black face. Yes, shockingly, Blacks were often made to wear blackface too. Marie is a prudish, preacher-raised girl who won’t abide by no hip-shakin’ or blasphemy. Raised to sing with a church quartet she is reluctant to be a featured performer with the likes of a woman who performs in warehouses and barns and sings with her whole body and soul rattling the rafters. “When they clamped down on my hips, they’d be stopping my metronome,” Rosetta admits. It takes all of Rosetta’s sly manipulations to loosen up Marie’s parochial notions, but when she does the duo tear the house down. “God don’t want the devil to have all the music!” she exults. 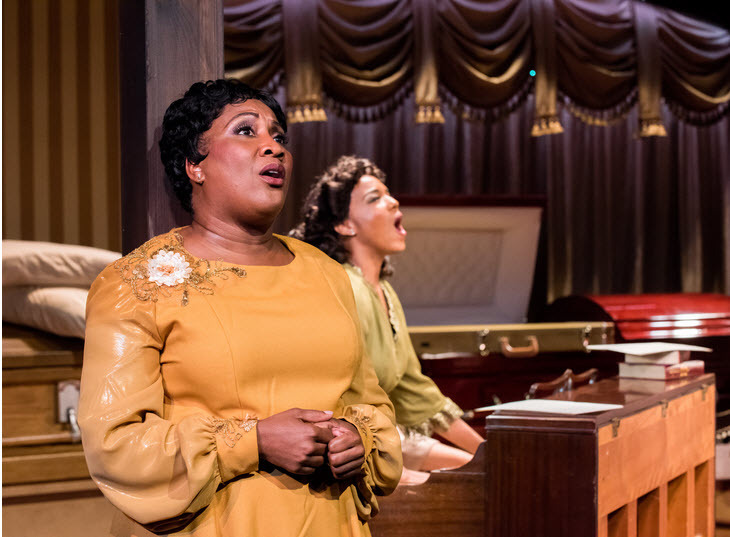 Roz White, a hugely successful and mesmerizing actor with a formidable, soul-shaking voice, plays Rosetta. White has been featured in numerous MetroStage productions Cool Papa’s Party, Ella Fitzgerald – First Lady of Song, Blackberry Daze, Gee’s Bend (Helen Hayes Award), Josephine Tonight and more. And if you’ve been following these reviews we have raved about her fierce talent for years. We discovered the joys of Ayana Reed (Marie) in the aforementioned Blackberry Daze and Master Class, both at MetroStage, as well as in The Gospel at Colonus at WSC Avant Bard. Legendary singer and guitarist, Barbara Roy Gaskins, fills in for Rosetta’s guitar playing as it moves from Gospel into Rock and Roll – a genre Tharpe is credited with creating and which was later copied by Jimi Hendrix, Elvis Presley, Johnny Cash and Ray Charles. The multi award-winning Blues and Gospel artist, Ronnette F. Harrison, plays the piano – and shows it a thing or two about a hip-shakin’ back beat. Filled with the sounds of Blues, Gospel, Boogie-woogie and Swing, with a little funky chicken thrown in for good measure (Rosetta worked with Duke Ellington and Cab Calloway at the Cotton Club), playwright George Brant’s feel-good, musical journey is a panacea for the soul as well as the spirit with unforgettable performances by both White and Reed. Musical Direction by e’Marcus Harper-Short, Lighting Design by Jonathan Alexander, and Costume Design by Michael A. Murray. Through September 30th at The Atlas Center for the Performing Arts – 1333 H Street, NE, Washington, DC 20002. For tickets and information call 202 399-7993 ext. 2 or visit www.MosaicTheater.org.